Clean and peel off ginger and cut it into small pieces. Keep few pieces of ginger separately. Grind and extract ginger Juice from the remaining ginger pieces. Cook red gram in a pressure cooker along with water until 2 or 3 whistles until it gets soft. Mash the red gram with the back of a wooden spoon and take the extract from it. Take a vessel and pour 2 cups of water into it. Add chopped tomatoes, salt, turmeric powder, remaining ginger pieces, rasam powder and asafoetida into the same vessel and bring to a boil. When the rasam begins to boil, add the red gram extract into the rasam. Heat oil in a pan; add mustard seeds and allow them to splutter. Now add the Curry Leaves into the pan and saute for a minute. Add this to the ginger rasam. Pour in ginger juice and let it boil for a few minutes. Remove it from the stove. Now squeeze out the juice from the lemons; strain the juice to remove the seeds and add to the ginger rasam. Garnish the ginger rasam with coriander leaves. 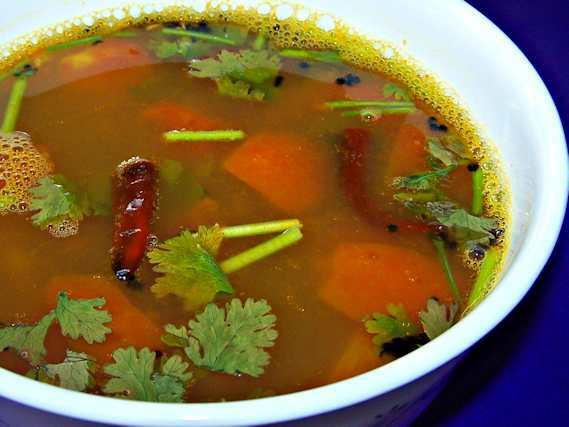 Ginger Rasam is now ready to serve. Hi I m Rishi ecxualy I was seeking so many recipee that the resion I opened website and I got so many recipee from your orginization ,,so that I m so thanking to u . Thanks Rishi. We appreciate your comments.